CBS news reported that Florence Welch, the lead singer for British band Florence + The Time Machine, had to cancel two upcoming concerts due to a vocal injury. July 11, 2012 @ 11:18AM : I've sustained a vocal injury and been told i cannot sing for a week.., seriously i felt something snap, it was very frightening. July 11, 2012 @ 11:20AM : unfortunately this means i will not be able to perform at Benicassim and Optimus alive festival this weekend..i am so so sorry.. 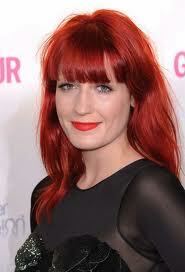 I am guessing that Florence had a blood vessel on her vocal cords that was causing minimal vocal impact. But with the "snap," the blood vessel likely ruptured causing instant vocal decompensation whereby the vocal pitch suddenly becomes much deeper and if bad enough, even complete voice loss as it appears to have happened to Florence. Normally, the vocal cords are pearly white without any vasculature. Watch a video of how this exam is performed. 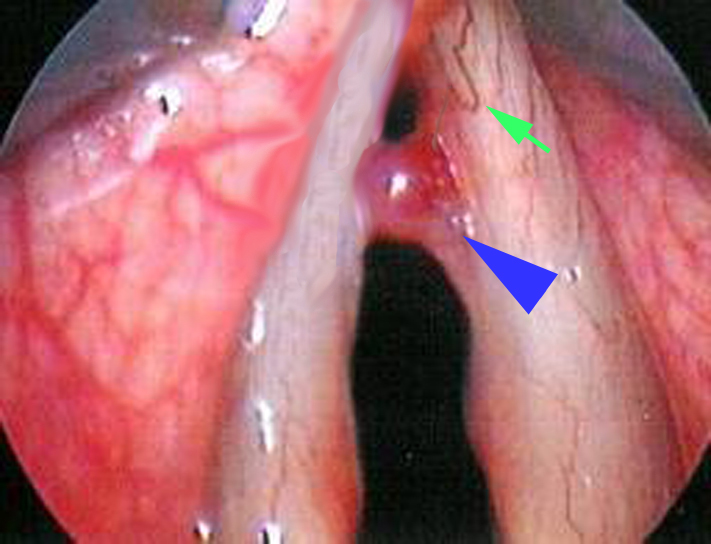 When there is a hemorrhagic polyp with a blood vessel as in Adele's case, her vocal cords may have looked like this where the blue arrowhead is pointing to a hemorrhagic polyp. The green arrow is pointing towards a feeding blood vessel. The issue with a blood vessel within the vocal cord itself is that it fluctuates in size due to whether it is irritated from phono-trauma or even hormones. If it is small, the changes may be non-existent. If it is more pronounced, the vocal instability may be noticeable and for a singer, it may make the voice very unpredictable. When the blood vessel becomes engorged and traumatized (singing forcefully, screaming, coughing), it may even rupture leading to a vocal cord hemorrhage. Especially in a woman, the blood vessel may be more prone to hemorrhage during her menstrual cycle (typically right before period). This is a dangerous situation for a singer because of their regular voice use and need to use it forcefully which increases chance of vocal cord hemorrhage. Rupture (even in the middle of a performance) results in hemorrhage into the vocal lining itself causing a sudden and complete loss of voice (see picture to right). There may even be mild pain associated with this occurrence. This is the "snap" sensation Florence felt. In Adele's case, she remembers the very moment this occurred during a radio interview when she "felt a pop" and her vocal pitch suddenly dropped into the bass range. This makes perfect sense... To use the analogy of a violin string, the thicker the violin string the deeper the pitch. When hemorrhage occurs, the vocal cord becomes thicker due to blood pooling resulting in a deeper voice instantly. If significant hemorrhage is present, the vocal cord may not even be able to vibrate causing vocal loss. Initially, during an acute vocal cord hemorrhage, STRICT VOICE REST is mandatory. With continued voice use, the patient risks abnormal healing that may result in the development or exacerbation of a vocal cord polyp. With repetitive cycles of healing and trauma, vocal cord scarring may even develop. Along with strict voice rest, steroids are often prescribed to help reduce the inflammatory swelling that often occurs as well as minimize risk of scarring. Unfortunately, though such treatment may resolve the hemorrhage, it will typically not get rid of the culprit blood vessel and associated polyp if present. In Florence's case where she was told to be on strict voice rest for only one week, I suspect no polyp is present. Just hemorrhage. If polyp is present, surgical intervention may be required. One option is to precisely cut out the polyp and cauterize the feeding blood vessel at the same time. This approach was the course that Adele pursued. Watch a video on this approach (video shows a generic vocal cord mass removal, but the approach is identical). The other option is use of a laser first to extinguish blood vessels present which may also significantly resolve the polyp followed by excision of the residual polyp at a later date. This latter approach is typically what I recommend. Why? It is relatively non-invasive and I feel the risk of scarring to be less compared with excision and vessel obliteration with a laser at the same time (though not zero). Furthermore, a smaller polyp also means a smaller wound that needs to heal. Shown at end of this blog article is a video of a vascular polyp being obliterated using a pulsed-dye laser (courtesy of Dr. Chandra Marie-Ivey). Another type of laser that may be used is a KTP laser. Read more about laser treatment of vocal cord pathology here. Regardless of how or in what order the surgery is performed, strict voice rest is mandatory for a period of time post-operatively. For Adele, that was strict voice rest for nearly two months (Nov and Dec 2011). Why? Because with talking or any other vocal activity, the vocal cords come together. After surgical removal of a polyp, there is a raw surface present which won't heal as well if the other vocal cord is banging against it. Talking after vocal cord surgery is analogous to jogging right after foot surgery.